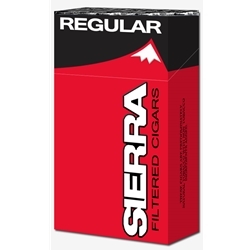 Sierra Filtered Cigars have a distinctive blend of American grown high-quality tobaccos that allows for a sensational aroma and flavor with exceptional smoothness, while still maintaining an incredibly low price. Every Sierra Filtered Cigar is manufactured in hard pack 100’s, this means you’re getting plenty of product for the price with stronger style of packaging. In an already over-priced world, Sierra Filtered Cigars brings to the table a high-grade first-class smoke, at an affordable cost. Sierra Filtered Cigars are distributed nationwide by Ohserase Manufacturing, LLC Akwesasne, NY located on the Akwesasne Mohawk Indian Reservation. Each of these discount filtered cigars are available at our online tobacco store in 3 unique styles to choose from. Full Flavor, Smooth, and Menthol. At Smokers Discounts, our motto has always been, sit back, relax and enjoy a great quality smoke at an inexpensive price. Sierra Filtered Cigars offers an excellent choice for your smoking needs. Our online cigar store was built specifically to help make it easy and affordable to buy filtered cigars online. Call us for more details!